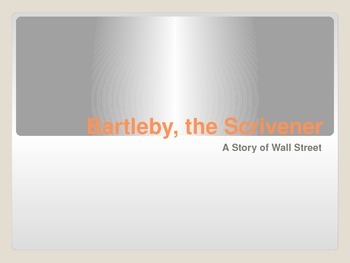 This is a group activity for when students are reading "Bartleby, the Scrivner" by Herman Melville. Good way to wrap up some of the elements of this short story. 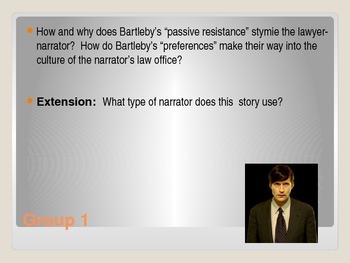 The assignment entails giving the students four questions to answer for homework about the story. The next class, they split into four groups to discuss their answers and then report out. 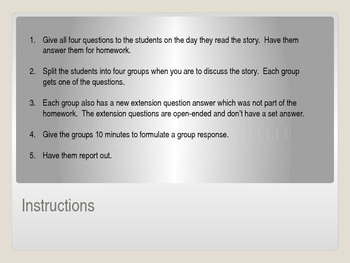 Each of the questions is very challenging, and then each also has an extension question that the students have not seen before. They also discuss the new question as a group. Comes with answers for the homework questions in the notes on each slide.